Beat eggs thoroughly, add salt, chilli powder, ginger- garlic paste. mix well and keep it aside. Take another pan add 4 tsp oil and fry all vegetables for 8 min and add salt and garam masala powder and fry for 2 min on medium flame. let it cool and add this to egg mixture. Heat remaining oil in a thick bottomed pan and por this egg mixture, cook on medium flame for 10 mins. Once golden brown, turn to other side and cook. 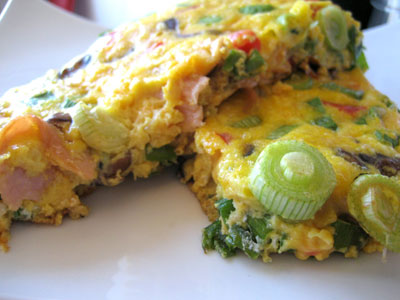 Check whether omelet is cooked well with the help of a spoon. Garnish with spring onions, chillies and serve hot. is it 1/2 tblsp chopped green chillies or 1/2 cup chopped chillies?